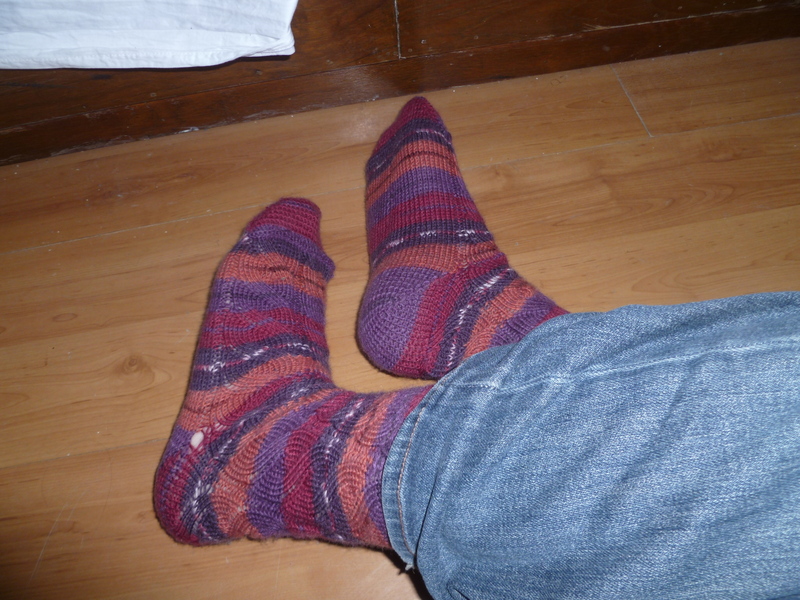 So, I finished my first pair of socks this week, the ones I mentioned way back in Charade. They’re sockerrific. Katia thinks I’m insane to actually wear them, after all the time and effort, but dammit, I made me some socks and I’m gonna wear ’em if I wanna. Charade, by Sandra Park. Found here on Ravelry. This project took me about three months, off and on. 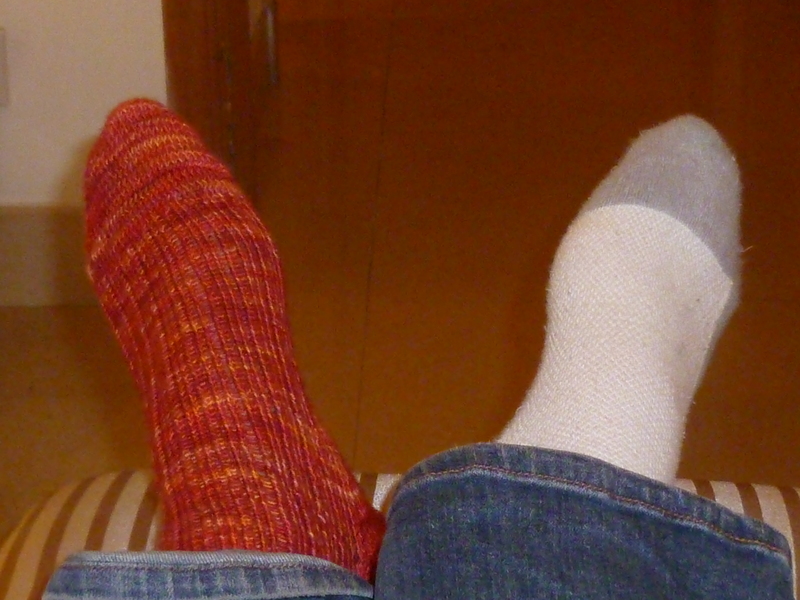 It was the kind of project where I wouldn’t touch it for two weeks and then the next day get a third of the sock done. I like color pattern of the yarn, but as I mentioned last time, I’d probably choose something a little sturdier for my next pair. Oh well. Now, for my next trick, a pair of gloves! If my past experience with knitting winter gear holds true, I should be finished with them around May. Warning: This post contains high quantities of knitting and wool. If this is not your thing, go find your own cup of tea, yeah? The weather this past weekend was excellent for knitting: dreary, cold and damp, with occasional downpours and cracks of lightning. Very impressive on the part of Mother Nature, especially since all I wanted to do was curl up with a cup of tea (thanks, Stephanie!) and “The History of Rome” podcast. Thanks to enforced slothfulness and a meeting of the Chengdu Ravelry knitters club (hi guys! 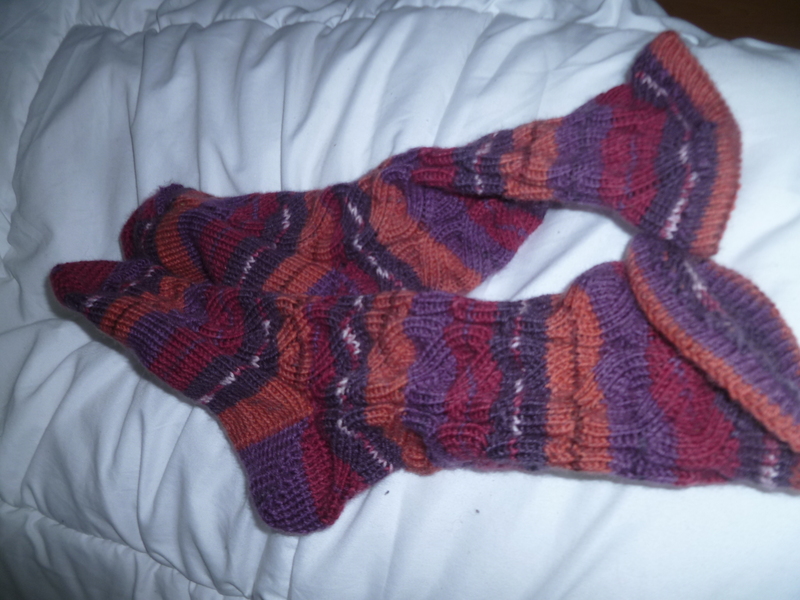 ), I finished my first real knitting project. Well, half of my first real knitting project. This is the super lovely Charade pattern from Ravelry. (Link leads to a restricted site, but registration is free and I highly recommend it if you want new patterns. I’m metaneira on there.) The pattern is very easy for beginners and not too hard to decipher. 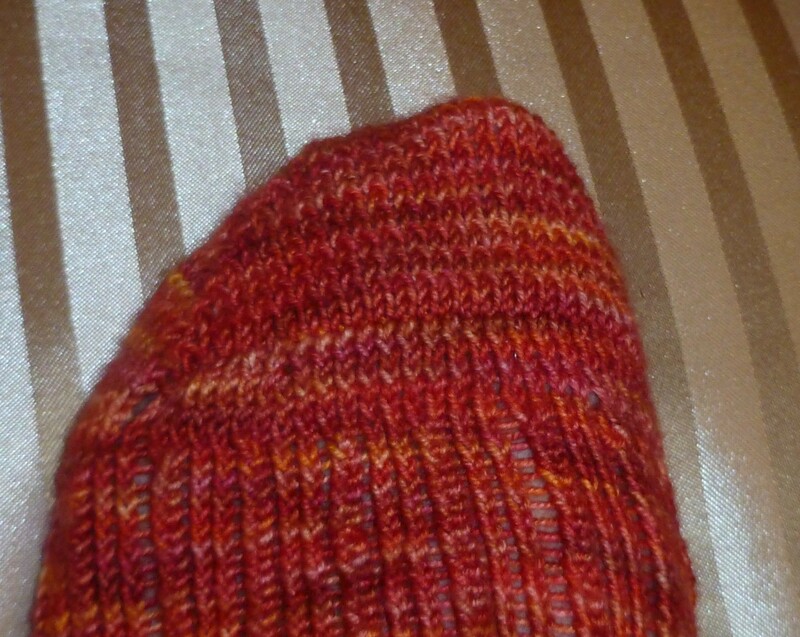 I deviated from the pattern in a few places, but mostly in the toe. The original pattern went mildly wonky and not at all suited for my ginormous big toe. It was kind of weird looking, so I frogged it and went looking for something a little more reinforced, to stave off the inevitable holes. I found the Nutkin pattern, also on Ravelry, and figured it couldn’t hurt to try. 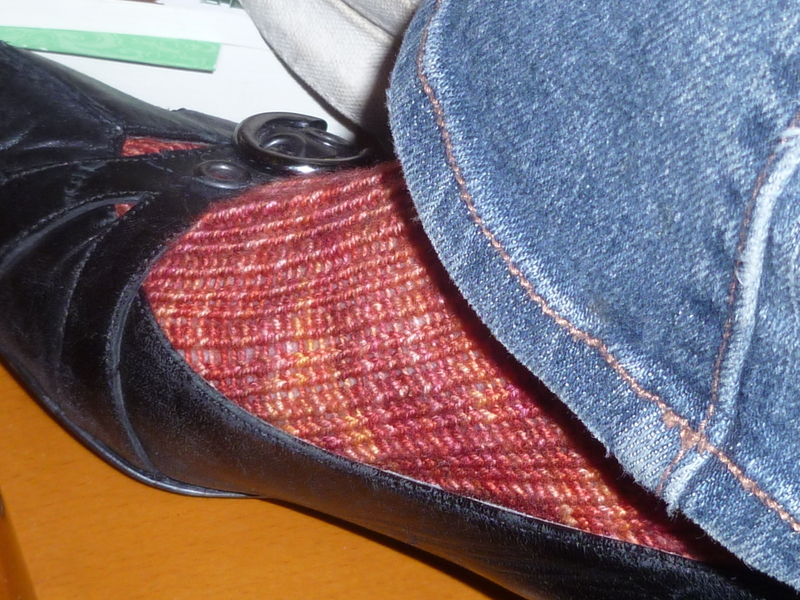 I also gave myself an extra three knit-purl rounds in order to accommodate my aforementioned big toe. This time, it worked like a charm. Also, cool thing, I hooked my phone SD card up to the computer and could load the pattern PDF onto it. Now I don’t have to print the darn thing out or spend an hour scribbling out incomprehensible gibberish onto whatever I have handy. Cool, huh? This wool is a superfine merino bought from the lovely ladies at the Knitting Cove in Port Jefferson, NY. If you’re in the area, check ’em out, they’ve got great stuff. I love the variegated reds and pinks. 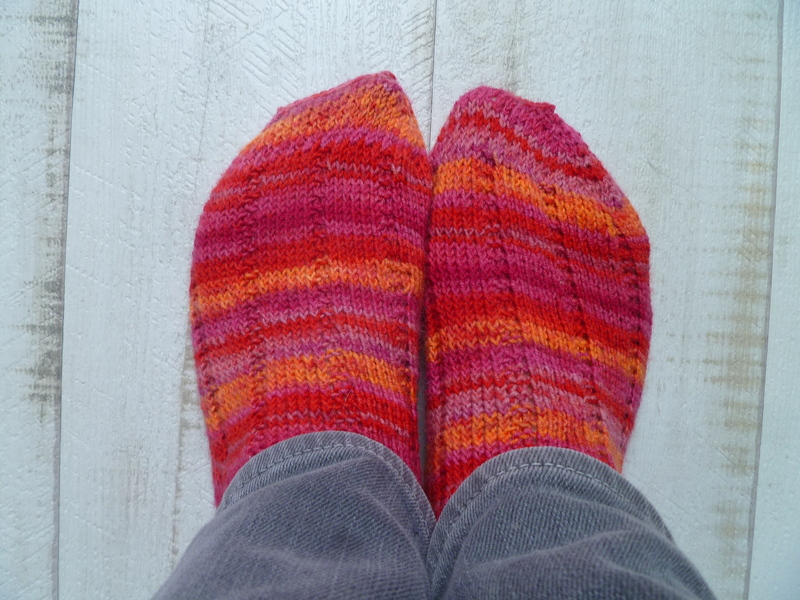 It’s very cheery, although, I’d probably pick a slightly sturdier wool for socks next time. It feels a little thin for someone as, uh, unkind to her socks as I am. 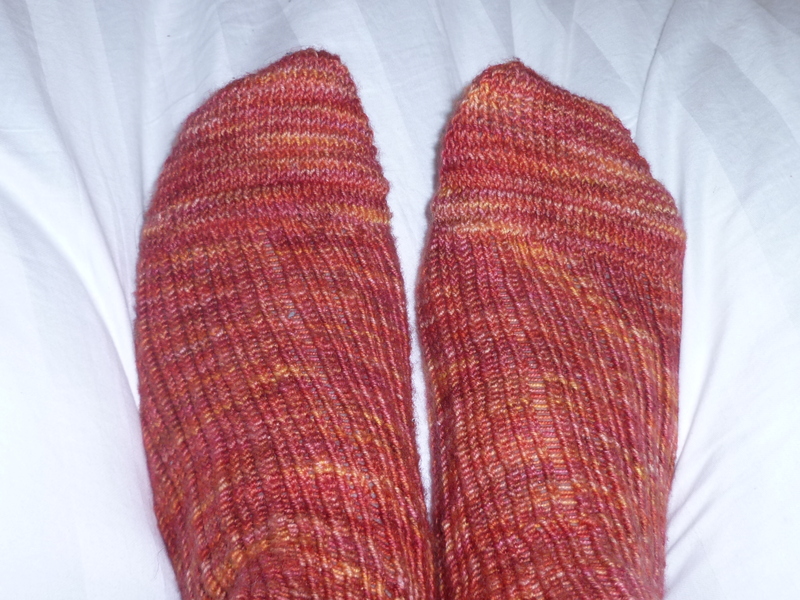 I used up about ¾ of a large skein on this first sock, but not to worry, I bought two! Yay for thinking ahead! 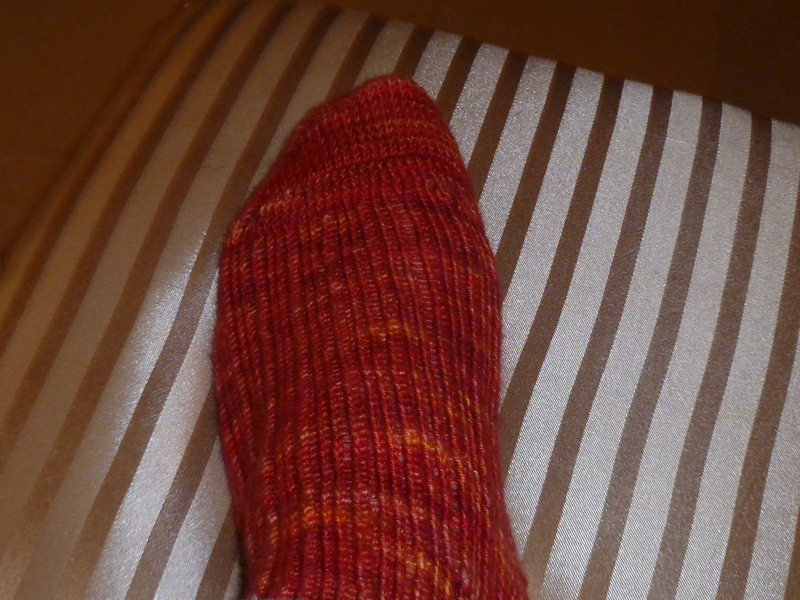 I feel really pleased about finishing this sock. Sometimes, my projects tend to go a little off, like the hat for a giant, or the sock that would have barely fit a child, let alone me. This sock took me about two months? Yeah, that sounds right. On the other hand, I frogged it like three times, due to hilarious mistakes. So, I figure the next one should go a little quicker, since I know what I’m doing now.